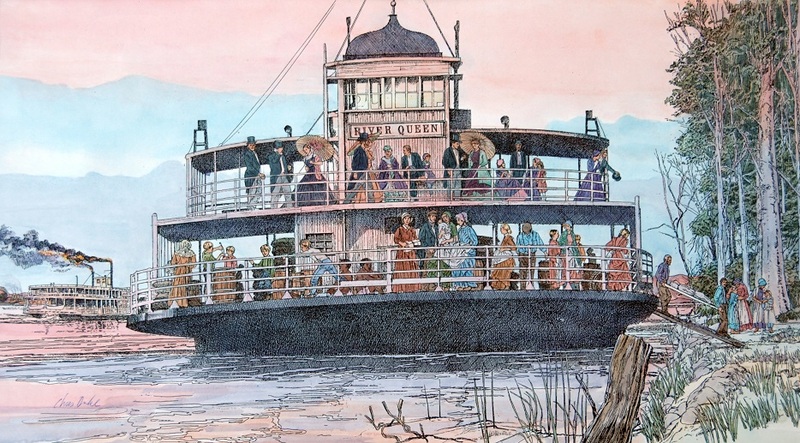 It is probably good for children to gain a non-romanticized understanding of the harrowing and dangerous rides up the Mississippi River in the 1850s. This illustration appears in the American Girl book Welcome to Kristen’s World – 1854. Many friends graciously posed one day for this piece. One good friend, Tara Martin, arrived from New Jersey laden with historical costumes to add to my chest of old clothes. People dressed inside and on the lawn and then paraded in front of our house as I took photographs. Although gathering the reference was great fun, it was a melancholy experience to depict little boys on the deck happily drinking cholera-laced water and the dead body being borne off the boat.